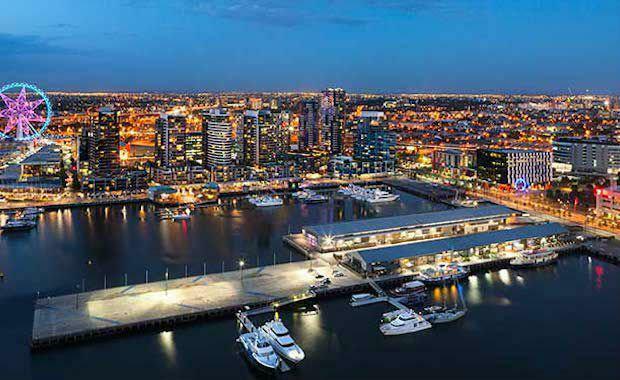 The towers mark the end of development at Lend Lease's $4.5 billion Victoria Harbour precinct. Lend Lease won the right to develop the precinct in 2001. Victoria Harbour is home to a slew of corporate tenants, including ANZ, NAB, Ericsson and Myer, and several other residential buildings housing more than 800 people. Planning documents show the new complex, to be called Waterside Place, will boast two north and two south towers – the northern towers reaching a maximum height of 90 metres; the southern towers 73 metres. They will sit on 19.5-metre podiums. One set of towers will be built on a parcel of land between Tom Thumb Lane and Waterside Place and will have 539 apartments. The other set will be built next door on Seafarer Lane and will offer 531 apartments. Credit: The AustralianMost of the apartments will be a mix of one-bedroom units; one bedroom and a study; or two bedrooms. Car parking for 748 cars is projected to take up the six floors of the buildings' podiums. With the Napthine government in caretaker mode before the November 29 state election, decisions about the new project will be a matter for the new planning minister. Lend Lease had no comment to make about the project. The 1000-plus apartments would be a huge addition to the 25 years' worth of apartment housing in the city that has been approved by Planning Minister Matthew Guy. Last week Lend Lease announced plans for a new $1.5 billion mixed-use project at Batman's Hill to be called Melbourne Quarter. Lend Lease secured the development rights at Batman's Hill two years ago and Mr Guy gave master-plan approval to the project just before the government entered caretaker mode. On a 2.5-hectare site between Collins and Flinders streets, Melbourne Quarter is situated where one of Melbourne's founders, John Batman, first built his home. The new precinct will boast a complex of high- and medium-rise towers offering 110,000 square metres of office space, 4000 square metres of shops and about 800 apartments.